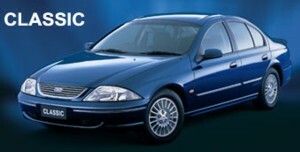 The AUII Ford Falcon was introduced in April 2000, as a minor facelift of the 1998 AU. Falcon- $32,415-$51,465. Fairlane- $50,990-$54,490. LTD- $64,820-$68,000. 237,701 Falcons, 11,906 Fairlanes, and 853 LTDs (all incl. AUI/II/III) were built. 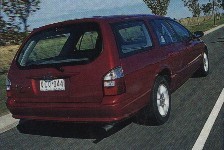 Replaced in October 2001 by the AU Series III Falcon. 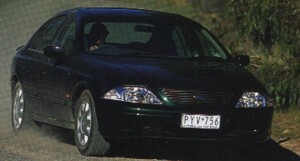 AUII FTE Ford Falcon range. Ford and Tickford continued their factory racing team in the V8 Supercars, FTR, into the 2001 Season. The 2001 drivers included #5 Glenn Seton, and #6 Steven Richards. This was the last season for the FTR team before reverting back to the Ford Credit sponsored Glenn Seton Racing (Ford Credit Racing). Some information sourced from Falcon Facts. SR - Based on Forte. Rear spoiler, side skirts, body-coloured mirrors and grille, chrome exhaust tip, 16 inch alloy wheels, ABS brakes, cruise control (from June). $3000 value for additional $400, April - October 2001. Futura Classic - 16 inch Prestige alloy wheels, side skirts, body coloured mirrors, leather steering wheel, velour interior, four power windows, chrome exhaust tip, floor mats, Classic decals. $2500 value, July - October 2001. Futura 75th Anniversary - 16 inch alloys, side skirts, body-coloured mirrors, bright insert in bumpers and body side mouldings, 75th badges on each front fender, chrome grille surround and exhaust tip, velour interior, four power windows, six stack CD, floor mats. July 2000 - March 2001. Fairmont Ghia 75th Anniversary - 17 inch Elegance alloy wheels, side skirts, rear spoiler, 75th badges on front fenders, leather interior, wood/leather Momo steering wheel, floor mats, security alarm. November 2000 - March 2001. Rebel - Ford Racing body kit, Momo gear knob and steering wheel, 18 inch Speedline alloy wheels, Rebel decals, PlayStation 2. Colours Venom (red), Silhouette (black), Monsoon (blue). July - October 2001. Xplod - 350kW, 5.7 litre V8 engineered by Rod Herrod, unique exhaust system with twin 4 silencers, Koni shockers and Lovell springs on suspension system, Momo 18 alloy wheels, Dunlop SP Sport 9000 P245/40ZR 18 tyres, Firestorm yellow paint finish, Tickford body kit, Recaro leather-trimmed driving seats, Sony sound system with 6 subwoofers (boot mounted), Sony Active Black Panel head unit, pivots to reveal the CD slot and controls, Sony DVD in boot with dedicated exterior speakers, 15 LCD screen on decklid. R5 - At Sydney Motor Show 2000, futuristic Utility concept. 4-door w/ suicide doors, 4WD, high mount driving lights, nudge bar, sculptured front bumper bar, wheel arch flares, integrated side skirts, 17 wheels, twin sideport exhaust outlets, integrated sports bar with several Hella high output lights, electronics including telematics, prestige sound system, auto climate control, satellite navigation and mobile communications. 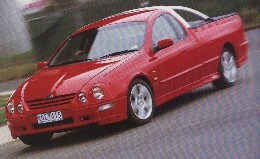 300+ - Falcon coupe by Advanced Engine Components, unveiled at Melbourne Motor Show 2001. 4.6L Mustang V8 develops 310kW (300+), 0-100km in 4.6 seconds, 18 inch alloys, Brembo brakes, Fairmont-based interior. Some pictures sourced from Ford.